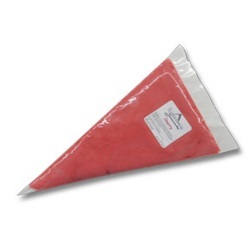 Product may be heated to approximately 80 degrees F for a thinner, quicker flower from bag. Product may be chilled in cooler/refrigerator for a thicker, slower flow from bag. For optimum quality, use unopened product within 365 days of the date of manufacture. Store in a dry, cool place at a constant temperature of 72 degrees F or below. If separation occurs, gently knead product in bag before opening. Fondant (sugar, corn syrup), water, cherry flavoring (water, propylene glycol, sugar, ethyl alcohol, polysorbate 80, citric acid, FD&C Red 40, xanthan gum, FD&C Blue 1), dried cherries, citric acid, potassium sorbate, cellulose gum. Line candy mold with melted chocolate coating. Let set up at room temperature. Squeeze filling into lined mold and let set for a few minutes to level out. Add melted chocolate to top of filling making sure to cover completely to avoid leakage. Place in freezer for a few minutes until chocolate releases from mold. Turn out of mold and allow to return to room temperature. Place in candy cup and place in box.